warn the public about national emergencies. The messages will bear the headline “Presidential Alert”, the Federal Emergency Management Agency said in a statement. Phones will make a loud tone and have a special vibration, said FEMA, which will send the alert. The test has been scheduled to ensure that the alert system would work in the event of a national emergency. U.S. cell phone users will not be able to opt out. I don't mind getting alerts from the private sector letting me know what is around me or baseball scores alerts. In the San Francisco Bay Area, there is an app called Citizen which alerts you when police activity is nearby. I subscribe to it. I also have programmed an ESPN app to alert me to a few final sports scores. But it is difficult to think what use a government national alert would serve. If we are under nuclear attack, will the alert tell us to hide under our desks? Further, with typical government arrogance, we will not be able to opt out of the alert. 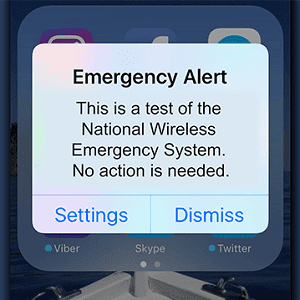 I view the alert test as typical government propaganda that implies the government could help in some big way that otherwise couldn't possibly occur and, therefore, we need government. It is kind of the "Who is going to man the lighthouse?" argument. The "This is why we need government" claim on steroids. Murray Rothbard was a wonderfully pleasant social companion. He had been a friend and colleague-he did the research for the passages in Up from Liberalism that dealt with economics. But in 1962, at an lSI-sponsored seminar at Yale, I spoke derisively, if with good humor, about Murray's proposal to privatize the lighthouses, suggesting that such a platform would persuade listeners less of the advantages of the private sector than of the disadvantages of knowing nothing about lighthouses. Rothbard was outraged and noisily denounced this journal, vowing never again to contribute to it. That is, the dense, or possibly evil Buckley (He is rumored to have been deep state CIA), distorted Murray's powerful pushing of the envelope away from government. We should take Murray's lead and be outraged at the distortion that government help is required that this government alert pretends to help us in a way the private sector could not. if you want to hear BS from the president all day you could subscribe to his Twitter. they like to do it with the TV as well. The alerd should say "In the event of a real emergency, you're on your own." Sent from government folks sitting in underground bunkers (which we paid for). "This is the President. This is an emergency message. You probably read about what I said about the president of China already. Now - duck!"